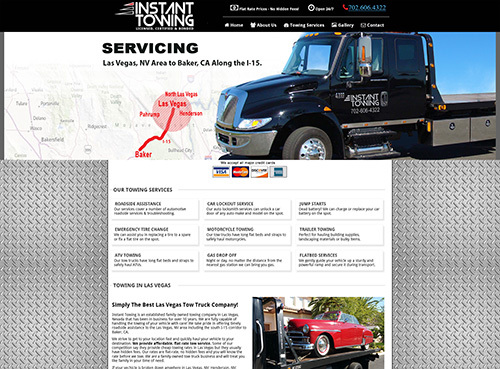 Aliante Web Design is proud to announce a newly redesign website for Instant Towing in Las Vegas, NV. We used php, html5 and CSS3 to create their website. The background is a solid steel design that accentuates the high quality and ruggedness of their tow trucks. Located in the heart of Las Vegas, Nevada Instant Towing Las Vegas specializes in roadside assistance, towing cars, motorcycles, trucks, suvs, providing jumpstarts, car lockout service and junk car haul. Their well-trained and professional staff uses high-powered, flatbed trucks. They emphasize fast response time and quality tow services to help you in your emergency situation. They ONLY hire experience and reliable tow truck professionals and they do a complete background check on each employee! They provide the best in towing services in Las Vegas since 2005.